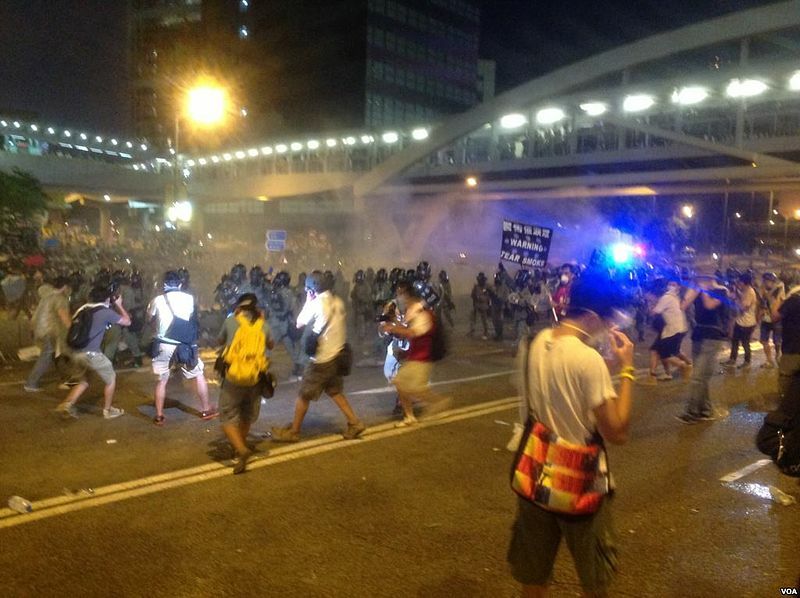 This post was written by Oiwan Lam and originally published  in Chinese on 6 October 2014 on citizen media platform inmediahk.net. It was translated by Loki Chu and Ronald Yick and republished on Global Voices as part of a content-sharing agreement. Just after students occupied the Civic Plaza at Hong Kong's government headquarters on Sept. 27, several independent pro-democratic websites, including Passion Times , Post852 , HKDash  and inmediahk.net  all suffered a frenzy of attacks by hackers that have left them highly unstable. Some sites have spent long periods of time entirely offline. Even the official website  of the civic group behind the massive sit-in action, Occupy Central with Love and Peace (OCLP), was taken down by malicious attackers for over two days. In an attempt to retaliate against police violence towards peaceful demonstrators, “Anonymous Asia” started attacking multiple websites  owned by the Hong Kong government and the pro-Beijing political groups. The hacker collectives brought down DAB website from the Internet on October 3 and continued to target at other pro-establishment and Hong Kong government websites. The government's news portal was disrupted briefly on October 4. Although some were supportive of Anonymous Asia’s action, the counter-attack is not helpful to the struggle for democracy in Hong Kong at all. The pro-Beijing groups and the Hong Kong government mainly depend on television news programs and channels for their press release and pro-Beijing printed newspapers for spreading their opinions, the online disruption has no real effect. On the contrary, the cyber-war declaration by Anonymous Asia seems to have scaled up the attack on local independent news sites since October 3. In contrast to the relative silence around attacks on pro-democracy and indy media sites, the Anonymous Asia’ attacks on DAB and the government news protal was highlighted in various mainstream news reports and has reflected negatively on the OCLP movement. During the early hours on Oct. 6, police arrested five people in connection with the Anonymous Asia attacks. They may face charges of accessing a computer with criminal or dishonest intent.